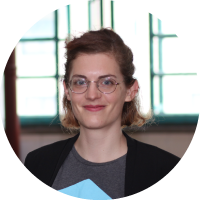 Nina Buchgraber Marketing manager at Blockpit with a critical view on developments and changes in all areas of the crypto space. Compared to December 2017 it is relatively quiet around Bitcoin and co. this holiday season. Still in a slump, the crypto market is not necessarily what traders and hodlers are wishing for this Christmas. At least, a bear market can help save taxes - if you have documented all your transactions properly. 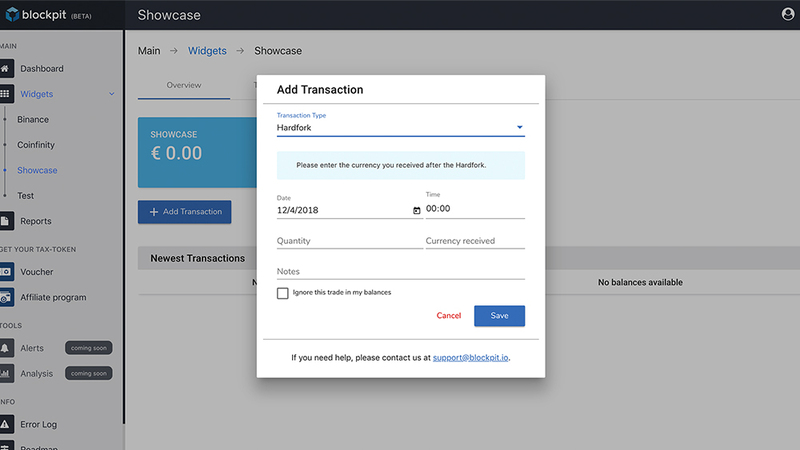 In the Blockpit app, special cases such as airdrops, hard forks and gifts can now be entered within minutes. 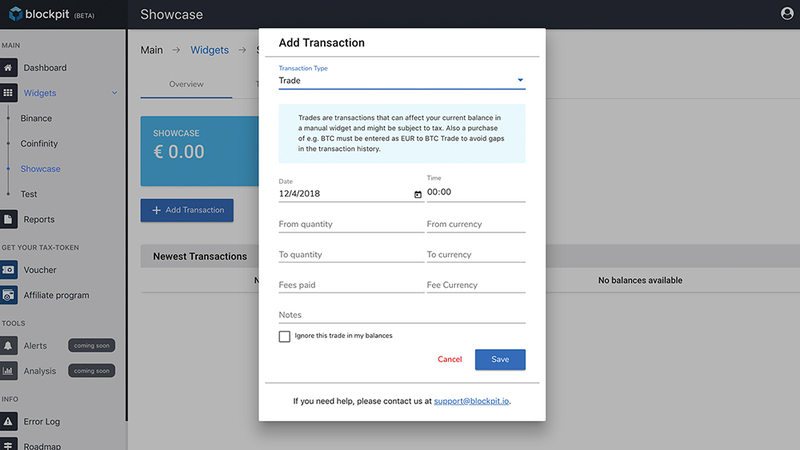 Let us show you how to enter (almost) all special cases correctly in your Blockpit account. We will also show you what you need to consider in order to realize losses before the end of the year. In most countries the tax year is the same as the calendar year. All profits realised until 31 December are tax-relevant for the current year. Losses can usually be deducted, but only within the tax year and the same type of income (in Austria and Germany). Losses from crypto trading can therefore be offset against any gains from speculative transactions, but not against other types of income. Why is it so important to document all my trades accurately? Nobody loves dealing with taxes, especially around the holidays. For crypto investors, however, it can be very worthwhile to get a clear picture of their portfolio before the end of the year. This is the only way to find out what to do to minimise your tax liability in time. To gain an overview, you'll need to calculate your profits and losses from trading, airdrops, hard forks and so on. Blockpit offers auto-sync for data from many exchanges. We've summarized how to create an automated widget in a separate tutorial. 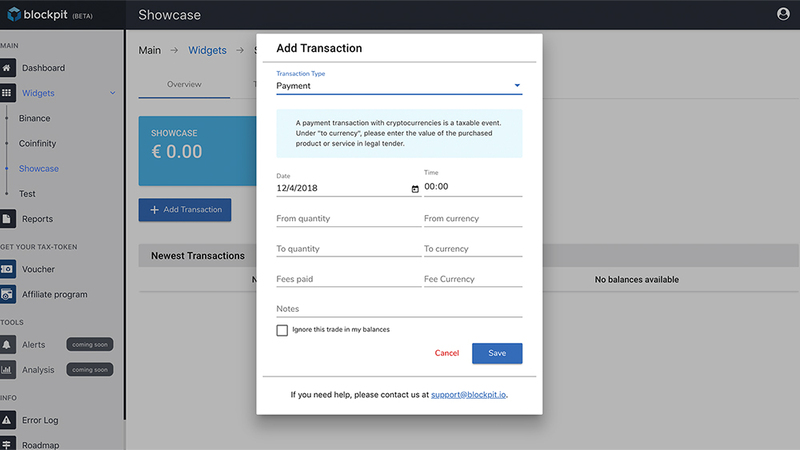 In this article, we will show you how to enter any type of transaction manually. After you have created a manual widget in your Blockpit account, you can enter any type of transaction. Read about what you need to consider and how the different transaction types affect your tax basis. If you exchange cryptocurrencies for legal tender or other cryptocurrencies, this is classified as a trade. Every trade is a taxable event. In Blockpit, you need to enter the quantity and currency of both exchanged units. You can also add fees. Balance corrections are not taxable. For example, you would need to enter a balance correction if you transferred coins from your hot wallet to a hardware wallet which also belongs to you. 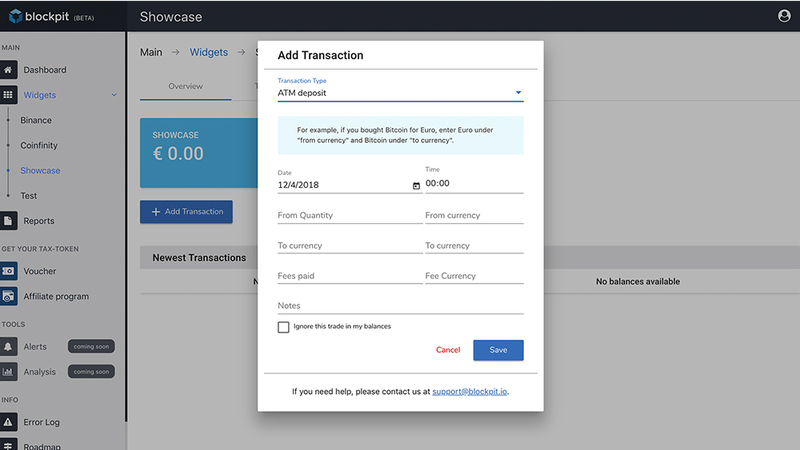 Using Blockpit, you just enter the quantity and currency that you want to add to or subtract from the widget's balance. If you are involved with a hard fork, you will receive new coins that must be entered in the affected widget. The acquisition costs always amount to zero. If you sell the new coins within one year of receiving them, you generate taxable income from speculative transactions. In contrast to hard forks, soft forks and token swaps are seen as a technical update that does not trigger a taxable event. To enter a hard fork in Blockpit, you need to specify the currency received. You can also indicate that the transaction is to be ignored in the balance. If you receive an airdrop without any service in return, this amounts to a tax-free gift. If the airdrop requests a service in return (e.g. advertising on Twitter), the airdrop is taxable as income from other services. In Austria, the tax-free limit is 220 euros per year here. If you want to enter an airdrop in Blockpit, please use the date on which you received the coins or tokens in your wallet. 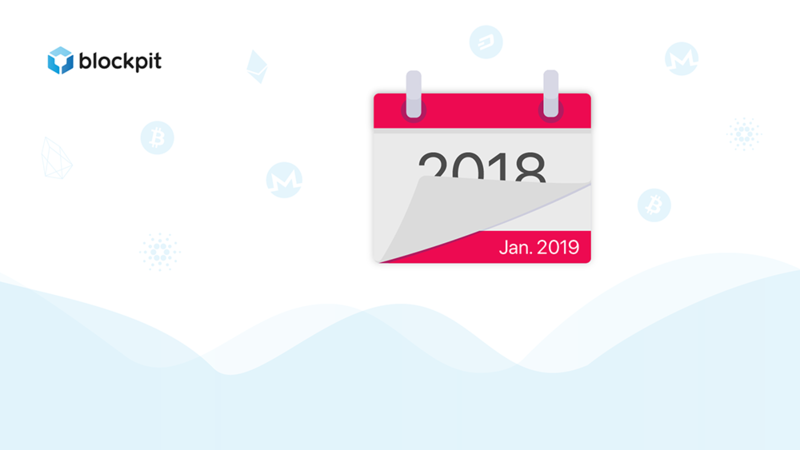 If you coins or tokens as a gift, the speculative period begins starts with the date on which the sender purchased the coins or tokens. 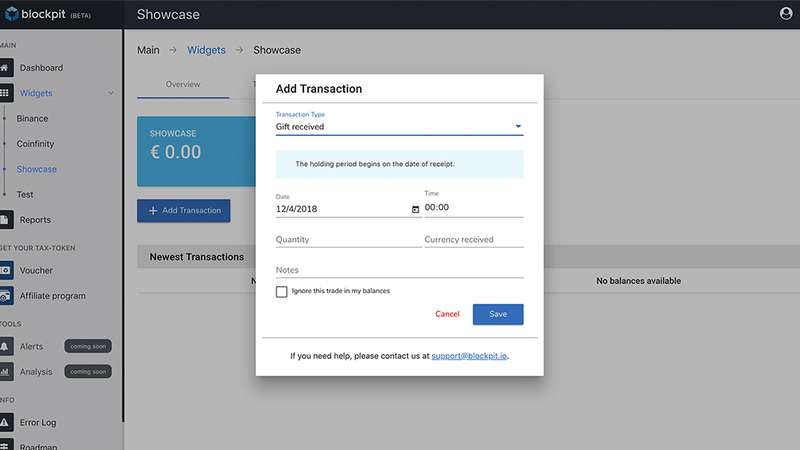 In Blockpit, you only need to specify the quantity and currency of the gift, as the purchase price for the gift is assumed to be zero. If you give Bitcoin & Co. as a gift yourself, this is not a tax-relevant transaction. ICOs are still not explicitly regulated by law in Austria. A taxable event occurs if tokens from an ICO are sold within less than one year of receiving them in your wallet. Since the tokens issued by an ICO are usually related to the business model of the issuing company, a VAT exemption may be applicable. When entering an ICO participation in Blockpit, please note that the date to be stated must be the time at which you received the tokens, and not the time of purchase. Fees can be deducted from the tax base. In Blockpit, you can enter missing fees by indicating their quantity and currency. If a cryptocurrency is used as a means of payment for a purchase, this transaction is taxable just like a trade, given that it took place within the speculative period of one year. Transactions made at Bitcoin ATMs are taxable in the same way other trades between legal tender and cryptocurrency are. Blockpit automatically determines your realized profits and losses. If you are discovering unrealized losses in your portfolio, it might be a good idea to sell the affected coins, re-buy them immediately and thereby realize the losses. As mentioned before, you can offset these losses from profits from speculative transactions and thus possibly reduce your tax liability. In a blog post about this topic, our CEO Florian explains in detail how to trade so that you can keep your tax bill down. Once you've updated your portfolio, you can sit back and relax - because in Austria you have until 30 June of the next year to submit your income tax return via FinanzOnline. If you are represented by a tax advisor, the deadline is extended to 31 March of the second following year, i.e. for 2018 to 2020. Anyone who is liable to tax in Germany must observe similar deadlines: If you use the "Elster" online portal, you have until 31 July 2019 to submit your tax return for 2018. The deadline for tax consultants is 28 February 2020.